Yet again I was asked recently by someone I had not seen in a long time what my "secret" was for losing all that extra weight I used to carry around. Used to be, anyone asked, I'd just say I did the "Paleo Diet" and if they were interested, I'd tell 'em to just check out marksdailyapple.com. But before I could even do that, the question was followed up with "You're not one of those caveman-paleo diet fanatics, are you?" Okay. Hearing that from this particular person convinced me once and for all: the PALEO DIET has jumped the shark. So I answered: "I'm not on a diet, I just don't eat GMO." "That's all you had to do?" "Yup. Thing is, once you start looking into just how much of the food we eat is sourced from GMO crops, you find yourself eating like a caveman." While it does appear that the Paleo diet has indeed been co-opted, subverted and marginalized in popular consciousness, I like to think that it went through a reformation once the most influential bloggers and writers of the Paleo blogosphere eventually rejected the idea that "low carb" and "zero carb" dieting is a key component to the praxeology. It took years to get rid of the commonly accepted idea that carbohydrate consumption itself was the reason for the rising rates of obesity and sickness of the citizenry all across the bloated plains. Same goes for various versions that involve measuring the ratios of fats to protein in your primal meals. This is because when many of us who first discovered the "paleo diet" blogosphere found successful weight loss and improved health and vitality after adopting the proscriptions, it was only too easy to credit the "low carb-high fat" theory as to why this "diet" seemed to work miraculously. But now that many of the luminaries of the Paleo blogposphere have moved on to studying the importance of gut bacteria, gut health and the role resistant starch and fermented pre and pro biotics plays in the immune system and over all health, a new angle on just how malevolent GMO crop feed is to human health emerges. At this point in time, when one gains a true understanding of how our modern, industrialized corporate food production system works, I can now confidently attribute it to the consumption of all three categories, for the entire feed industry is based off of manufacturing products from carbohydrates, proteins and fats...all derived from GMO plant crops. It's the GMO itself and how it affects the gut bacteria of not just we the sheeple, but any living organism that ingests it on a regular basis. Most folks who discover the "Paleo diet" after years of ill health and weight management issues. For the early adopters, while the low-carb paradigm has since been proven fallacious, nevertheless it does prove effective, because limiting carbohydrate intake means largely limiting your intake of GMO sourced feed. But for most people today, it takes a health condition or weight management problems to get them to look more closely at exactly what they are eating. But I see an even bigger problem that is going to manifest in an even worse outcome in the next decade or so with regards to kids being raised from birth on GMO feed products. Sadly today, I note that many parents in society today are feeding their children a steady diet of GMO processed feed products like cereal, chips, crackers, cookies, cakes, pastries, and all sorts of snack foods designed to make the kids stop whining and crying about their hunger for a few minutes. Most folks never make the connection between their children's behavior and the snacks and breakfast cereals they are feeding them, and if they do, they invariably blame the sugar content. Sugar most certainly does have an effect...but that is only part of the story. Farmers are reporting the same thing with pigs raised on GMO corn. According to Dr. Huber, a farmer told him that “his pigs just seem to be always irritated. They can’t get along with the other pigs.” Veterinarian Don Skow described similar odd behavior in the pigs of his client. “They would get cannibalistic. They would consume each other—ear biting and tail biting.” And when put in nurseries after weaning, he says, some “would get a condition like Alzheimer’s. They would lose the ability to know where the feed was. A lot of them would die.” Although many of these odd behaviors had been dismissed as normal stress responses for confined animals, when farmers switched to non-GMO feed and the problems went away, the real cause became obvious. Dr. Irina Ermakova, PhD, a senior researcher at the Russian Academy of Sciences, reported to the European Congress of Psychiatry in March 2006 that male rats fed GM soy exhibited anxiety and aggression, while those fed non-GMO soy did not . Ermakova reported the same behavior in GM soy-fed female rats and their offspring in her study published in Ecosinform. The animals “attacked and bit each other and the worker." I know parents who are at wits end with their children's behavior. From my point of view, they love their children, but don't really like to spend time with them because of their incorrigible behavior. And they often remark at the stark contrast with my own progeny who is calm, well behaved and easy to babysit. Mind you, my kid is not "perfect." But the differences are readily apparent enough for many folks to comment. And they always tell me that I'm "lucky." At this point, I say it with full confidence that luck has nothing to do with it. Family who knew me as a kid are especially amazed at my offspring's demeanor, attitude and behavior, given how much of a little ADD/ADHD/ODD hell raiser troublemaker I was. My wife likes to take credit for her genes being the primary factor there, and there may be something to that. But I've seen it one too many times now, how little kids attitudes and behavior changes for the worse, sometimes in mere minutes after eating or drinking GMO-based junk feed. When I try to suggest that maybe parents should feed their kids nutritious, home-cooked food instead of eating processed feed, they all say the same thing - there's no time for that. Everyone has got to fight traffic jams to get to school and work, so it's coffee for the adults, and breakfast cereal and snack foods while riding in the car. Then the kids get their GMO-based feed from their school vending machines, nearby convenience stores and the cafeterias. By the time working parents and school kids are home in the evening, everyone is too tired to cook, so they eat fast food or restaurant take out. It's no exaggeration to say that for many folks in our Brave New World Order, when it comes to their diet, it's all GMO, all the time. 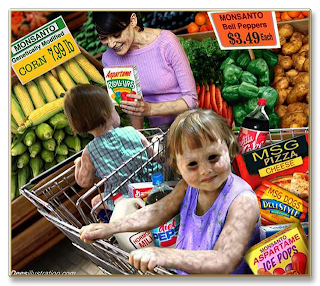 Having read the product labels and researched the brands of much of the "kid snacks" many parents are feeding their kids (not to mention the regularity of eating fast food meals,) everything they eat is inevitably sourced from one of these 6 major corporate feed brands, who are also the primary backers for funding the opposition to several mandatory GMO-labeling initiatives that got voted on earlier this month in the mid-term elections of several States. They spent millions to fund propaganda to prevent them from having to label their GMO feed accordingly. This behemoth has hardly been touched by consumer frustration with GMOs, even it is just as guilty as many other companies when it comes to food secrets. This is also the company who had to settle a $9 million class-action lawsuit over Naked Juice false advertising – claiming the products were ‘all natural’ and ‘100% juice’ when they are actually full of GMOs. Pepsi-Co was also revealed as one of the big spenders behind the anti-labeling campaigns illegally filtered through the Grocery Manufacturer’s Association. The company topped the list with a $1,620,899 donation to keep you in the dark about GMOs. This company is downright shady. Kellogg’s company recently paid $5 million to settle a class-action lawsuit for falsely labeling Kashi products as “All Natural” or “Nothing Artificial.” They have also contributed a total of $1.6 million to defeat GMO labeling initiatives. In a consumer lab test, it was also found that Kellogg’s uses 100% GMO corn in several of their breakfast cereals and other products. Kashi products even made it onto the Non-GMO project’s list of safe foods, but they aren’t safe at all. This company puts GMOs in baby food. Need I say more? The company removed GMOs from baby formulas in South Africa after public pressure forced them to, but it continues to put them in American-sold versions. Formulas like Good Start and others contain GM soybean oil, GM soy lecithin, and GM maltodextrin, as well as corn syrup derived from GM crops. Along with Pepsi-Co and Coca-Cola, the company spent over $1 million to defeat GMO labeling in Washington, and more to defeat labeling in Oregon. Just how much will you like that chocolate bar after finding out that Hershey’s donated $800,000 to defeat California’s Prop 37 and Washington’s I-522, and another $500,000 to defeat this year’s initiatives in Oregon and Colorado? The company has only one organic brand—Dagoba. Time for a boycott? After all, there are hundreds of non-GMO fair-trade chocolate makers out there. Try some of these non-GMO sweets instead. This soda empire has contributed more than $1.5 million to keep your teeth rotting from consuming their GMO-filled sodas. They also utilize high fructose corn syrup that is almost entirely GMO-corn derived. Here are other sodas that contain GMOs, too. I know of kids for whom it seems their entire diet is based on the products of these corporate GMO feed conglomerates. While the article I posted urges a boycott of the products of these corporations, I urge parents to boycott these products for your kids health, your peace of mind, and your sanity in trying to simply raise them. I'm not sure I agree to most of this. I believe a bigger cause of a lot of the symptoms you mentioned is processed foods and an over-intake of sugars. Consuming excessive amount of sugar, combined with refined carbohydrates and not enough vegetables, protein and fat together contributed to the overweight epidemic. Most of the world is experiencing an increase in weight and related problems of health and in many European Countries GMO's are severely limited due to stringent regulation. I believe a bigger cause of a lot of the symptoms you mentioned is processed foods and an over-intake of sugars. At this point in time, this distinction no longer matters. Nearly all processed foods are made with GMO crops. Stop eating GMO means you stop eating processed foods. Far simpler way to communicate with people about "my diet" while avoiding the perception of the "caveman fad diet" stigma. I can corroborate this. I spoke with a sheep farmer this summer who saw this same affect! He ran out of his usual GM feed and fed some non-GMO feed to one of several groups of lambs; basically doing an unwitting side-by-side trial. The GMO Free lambs were placid and docile and easy to handle and did NOT abuse each other in stark contrast to his usual experience. Anonymous said that in Europe GMO is severely limited and he's right. For majority of people in EU is eating processed non-GMO food perfectly viable option and although we aren't as fat as Americans, obesity is here a big problem too. It's kind of funny though that reasons for regulating GMO here aren't about health but about economic protectionism because there are no real European based competitors to Monsanto etc. I've recently watched Food, Inc. and King Corn on DVD with, of course, your posts in mind. What do you think of them, and if worthwhile, are there other similar-genre documentaries that you recommend? Haven't seen King Corn, but Food Inc. has permanently ruined my taste for eating chicken whenever I go out to eat at any restaurant. While it's not a documentary per say, you gotta check out the movie Fast Food Nation. I will never buy Gerber for my kid (I just had a new baby girl my second one in six years) ever again! That was sad since my first kid really loved Gerber broccoli when she was a baby.. . .
For that I have included this one on our yearly Thanksgiving Testosterone-filled Turkey Linkfest! Thanks ironthumb, and a happy thanksgiving to you too. Great post, adhd has been linked to a lack of omega 3's which are pretty much nil in todays corn based world. Food labeling is a joke. We are eating crap from China all the time but you won't read it on the label. Over 85% of tilapia is raised in Chinese cess pools. Interesting points on the lack of GMO in low carb diets. From top to bottom are lies, a much more effective mechanism than using pure force. Give the serfs unimportant freedoms and cater to their basic instincts and you get a docile proletariat. Last June, I was in Peru to meet my fiance's family, see the country, etc. Do you know I lost FIVE POUNDS in 12 days? I did! I didn't eat less, either. Unlike here, the food is fresh. It's fresh at the mercado, not processed like it is here. It's also fresh in terms of how it's grown; it's grown WITHOUT genetic modification or any of that other stuff we do here. IOW, it's grown in the soil, just like God intended. It's the same with meat and poultry down there. The chickens and cows are not fed growth hormones to fatten 'em up; they roam on the range/farm, eat grass, and that's it. Then, when the animals are killed, they're brought to the mercado. In the mercado in my fiance's part of Lima, the chickens still have their talons; that's how fresh and UNPROCESSED the food is in Lima, Peru. If that's not fresh enough for you, by golly, they'll go out the the barnyard and kill one for you! When you eat good food, you have less problem going to the bathroom. Constipation isn't an issue there. Anyway, when I ate good, healthy, NATURALLY grown & prepared food, the pounds started MELTING away! I have to say I agree with you here.